To get a flavour of what schools and classes were Tweeting about last Christmas, have a look at the project transcript HERE (Part 1) and HERE (Part 2). I know that lots of teachers joined Twitter on Summer courses again this year, so this might be the perfect opportunity for you to Tweet with your class. Let other schools/classes that you are in contact with through Twitter know about the project and invite them to join in. If you are in contact with a school abroad, get them to join in too to give the project an international dimension. A couple of years ago, some schools from the US and Canada joined in one of the Twitter projects and my own class really enjoyed the international element to the project. To make the project truly collaborative, don’t forget to reply to, comment on, or re-Tweet the Tweet of another school. So let’s build up a picture through Twitter of the sort of seasonal Christmas work going on in Irish classrooms in the run-up to the holidays. 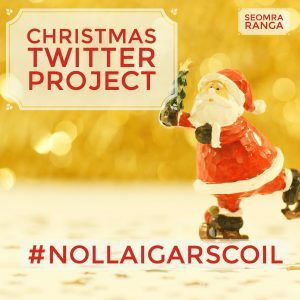 Above all, don’t forget to use the project hashtag on every Tweet: #NollaigArScoil (You don’t need to tag Seomra Ranga in the Tweet to take part). You may wish to use a Twitter Client like Tweetdeck, Hootsuite or Twitterfall which will allow you to set up a specific column to view all of the #NollaigArScoil timeline Tweets as they come in during the week. 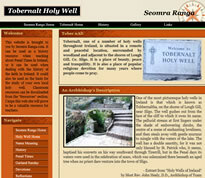 A condition of joining in the project is that you agree to have your Tweets collated into the project transcript to be available as a download to all teachers through Seomra Ranga/Nollaig Shona. If your class Twitter account is protected, you will have to unprotect it during the project to have your Tweets included in the transcript. If you are comfortable with those simple conditions, then let the Tweets flow until the end of term. 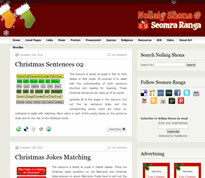 Again, don’t forget to include #NollaigArScoil in every Tweet so that it can be collated into the transcript.